The Annual Inflation Rate Chart which shows the annual inflation rate from 1989 through the present. It also shows the effects of Quantitative Easing and the long term trend of inflation. The average inflation rate by decade chart shows each decade between 1913 (when the Bureau of Labor Statistics began tracking the CPI) and the current decade, plus the long term average inflation rate. 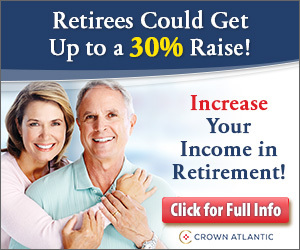 Just like compound interest compound inflation grows faster and faster. The Cumulative inflation chart shows how inflation has compounded over the years since 1913. Total Inflation by decade is an interesting comparison of the total accumulated inflation during each decade since 1913. Rather than looking at average inflation for each year during a decade this chart looks at the total. The inflation and recession chart shows the correlation between inflation and recession. Does rising costs make people unable to afford goods and so the economy would fall into recession? This chart will tell you. The Misery Index was designed by economist Arthur Okun as a "quick and dirty" way to gauge the overall well being of the average person. 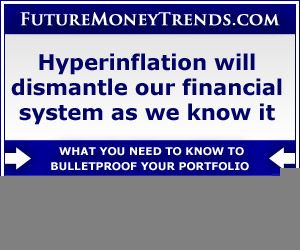 It combines the inflation rate with the unemployment rate. One of the biggest hyperinflations in history occurred during the U.S. Civil war and was primarily a monetary event. In the chart of Civil War Inflation we show the results. Inflation Adjusted Crude Oil Prices Chart shows crude oil prices since 1946 along with their inflation adjusted equivalent. So you can see how current prices and peaks like those in 1980 and 2008 compare. As commodities gold and oil are subject to a variety of different economic and political forces. 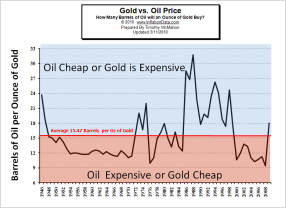 By comparing Oil vs Gold directly we can judge whether either is over or under priced in an effort to make better investment decisions. Prices and wages don't increase at the same rate, so you need to adjust prices for inflation in order to see how everything compares. The Inflation Adjusted Natural Gas Chart shows the inflation adjusted price of natural gas since 1981. People often wonder how well crude oil prices correlate to the price they have to pay at the pump for their gasoline. This chart shows the correlation between crude oil prices and gasoline. The Cost of Gas chart is updated daily and shows the current average price of gas by county throughout the continental United States. It is interactive and allows you to zoom in and drag it around to view any specific county. The Inflation Adjusted Cost of Electricity Chart shows electricity prices adjusted to current dollars so you can compare the purchasing power effect on the price paid for electricity. Gold is often considered to be an excellent inflation hedge, but is it? In this chart we look at the Inflation Adjusted Price of Gold to see how well it kept up with inflation. This Inflation Adjusted Price of Corn chart depicts the rise in the price of corn per ton since 1981 in both nominal (actual price paid) and in inflation adjusted terms. Education costs have risen dramatically since 1985 and this Education Inflation chart shows both the nominal cost of inflation and the inflation adjusted cost so you can see how education costs have increased compared to other costs. Housing prices rose rapidly for the twenty years from 1985 through 2005 and then they went into free-fall. In this chart we show the inflation adjusted housing prices from 1970 through 2013. During the 40 years from 1971 to 2011 housing prices appreciated an average of 4.81% a year, and interest rates averaged 8.85%. In this chart of the real return on mortgage rates we can see the historical rates since 1972. Stock brokers are constantly touting stocks and mutual funds as great investments. But how have stocks performed in inflation adjusted terms? This chart shows the NYSE in both nominal and inflation adjusted terms. Although the Federal government has discontinued publishing the M3 money supply numbers it has been recreated here in this Annual U.S. Money Supply Growth Chart.